News that last year's federal deficit was smaller than expected is prompting economists to project a smaller deficit for the current fiscal year as well. The Finance Department announced Tuesday that the final deficit figure for last year came in at $17.8-billion, an improvement over the $23-billion projection in the March, 2017, budget. The size of the deficit is still at odds with the Liberal campaign promise to keep annual deficits under $10-billion. 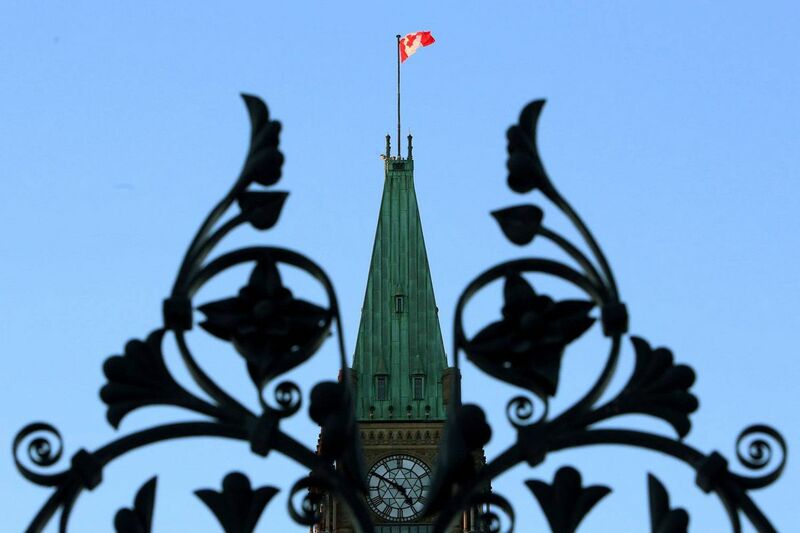 Economists at RBC now estimate this year's deficit could come in below $15-billion, nearly half the size of the $28.5-billion deficit Ottawa projected just six months ago. A big factor contributing to the rosier fiscal forecasts is the fact that the Canadian economy is outperforming the predictions of private-sector forecasts that informed the budget estimates. This year's budget is built on an assumption that the economy would grow 1.9 per cent this year and 2 per cent next year. Private-sector forecasts since the budget have been gradually nudging upward and the Bank of Canada's latest estimate projected growth of 2.8 per cent this year. Prime Minister Justin Trudeau claimed Tuesday that the improving economy is a sign his government's policies are working. "What the numbers mean is that our plan to grow the economy for the middle class is working," he said, referencing increased support for families with children and the government's infrastructure program. Conservative Leader Andrew Scheer challenged that view, noting that Liberal deficits will ultimately force taxpayers to spend more on debt-servicing costs over the long term. "The deficit's not down. The deficit is much, much higher than the $10-billion dollars that Justin Trudeau promised," Mr. Scheer told reporters at an event with small-business owners, noting that the Liberals have no plan for eliminating the deficit. "That is leaving my kids and future generations of Canadians with a big bill that has to be paid back. That's not fair." Tuesday's report indicates that $16-billion of the $17.8-billion shortfall can be attributed to a year-over-year increase in program spending. Shortly after forming government, the federal Liberals jettisoned their initial spending plans by claiming that weaker-than-expected economic growth had significantly worsened the assumptions for federal revenue and spending. In December, 2016, the Finance Department released a long-term forecast showing that federal finances were on track to remain in deficit until the 2050s. The Liberal campaign promise was to eliminate the deficit in 2019. The report released on Tuesday looks at the last fiscal year. It does not contain forecasts for future years. Finance Minister Bill Morneau is expected to provide a fall fiscal update that will show how the recent string of good economic news will affect federal deficit projections. The Finance Department is also expected to update its long-term fiscal projections at some point before the end of the year. For the 2016-17 fiscal year as a whole, Tuesday's report shows that revenue decreased by $2-billion, or 0.7 per cent, from the previous year. Program expenses increased by $16.2-billion, or 6 per cent. Mr. Morneau has not announced a clear target date for eliminating the federal deficit and Mr. Trudeau repeatedly declined to provide a target when asked Tuesday by reporters. Instead, the government has said its so-called "fiscal anchor" is to keep the size of the federal debt on a stable and declining trend when measured as a percentage of the economy. By that measure, the federal debt grew slightly. It now stands at 31.2 per cent of GDP, up from 31 per cent in 2015-16. The combined provincial and territorial debt also rose last year to an estimated 30.3 per cent, up from 28.5 per cent the previous year. Provinces and territories posted a combined deficit of $14-billion in 2016-17, up from $9-billion the previous year. Randall Bartlett, chief economist at the University of Ottawa's Institute of Fiscal Studies and Democracy, said Liberal policies such as enhanced benefits to families with young children have contributed to stronger growth. However, Mr. Bartlett attributes most of the growth to other factors, such as an improving global economy and low interest rates. "I think there was a positive impact of their policies on a net basis," he said. "But their policies are not the primary cause of what we've seen in terms of growth." While Mr. Bartlett agrees that this year's deficit is on pace to be smaller than last year's, his forecasts project that the size of deficits will increase in future years due to higher debt-servicing costs. With files from Laura Stone.